Alerts, Workflow, Notifications, oh my! 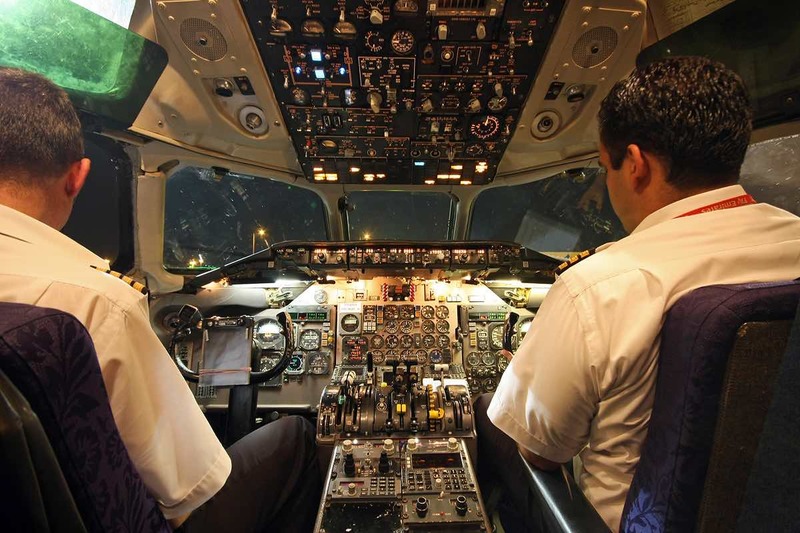 Being an airline pilot isn’t easy. There’s literally hundreds of things you have to constantly monitor in order to make sure you didn’t miss something important. That’s why it takes thousands of hours of training. ERP systems are very similar to planes in many respects. The hull is usually made by one manufacturer, but almost all the components come from different vendors and then get plugged together in order to create an operable plane. And, of course, each component is a potential point of failure and maintenance. So to accommodate this there’s a dial in the cockpit for each component, and the pilot is trained to know where to look and what to look for. Most of the time there’s nothing of value to see, but the information keeps coming and coming. Miss something, and bad things happen. Notably, neither Google nor Apple make planes. If they did there wouldn’t be hundreds of dials in a plane. There would be one. And each component would plug into a notification framework that alerted the pilot only when there was something to do, or something worth seeing. All you have to do is to look at your smartphone to know this is true. Thousands of apps, one notification framework, one place to look for them. For many people, using an ERP system sometimes feels like flying a plane. So many things to do, so many places to check – but with no training. It’s no wonder people are frustrated, confused, and that so many things get left undone. Imagine an ERP system where there was one place to go to see what needs to be done? Wouldn’t that be something. Unfortunately, software makers went the same route as airplane manufacturers on this, and what resulted was the alert, the notification, the icon badge, the worklist item and more. A cacophony of dials. Information overload, scattered across multiple systems and dashboards. It’s become apparent that the industry has swung too far to the extreme when it comes to notifying the user. Now every application has its own alerts or worklist. There are so many of them and they are never in a single location. People have been desensitized and now the alert/worklist has lost its meaning (kind of like the car alarm). That is bad for all of us. How do we get back to the promise of a simple, single, to do list? Traditionally PeopleSoft uses the Worklist to communicate and track action items for its users. With the latest PeopleTools release, Oracle has introduced something called the “Events and Notifications Framework”. You may have seen screenshots where the labels “Actions” and “Alerts” are used as pictured below. This is all part of the Fluid notification center located under a Flag icon in the header, and adds yet another cool feature for notifying people of things they need to be aware of. And, of course, adds to the challenge of providing a one-stop shop for all notifications. As of this writing, the PeopleTools Event and Notification framework isn’t deeply documented, but this is just the early days of this feature. Modules like ePay Mobile and Absence Management are using it in 9.2, but there really isn’t enough documentation today to easily build your own notifications. However, it is a very useful tool and if used properly, can add a lot of value. So how do we fix the UX problem? One problem is that too many things are alerting us these days. We are all beginning to suffer from Notification Fatigue. It has been reported that the famed 2013 Target Hack actually triggered some alerts in the security admin’s consoles. The problem was that there were so many alerts, the admins had begun to tune them out! The first step is what we call Alert discipline. Not everything needs to be an alert. This is a classic case of less is more. 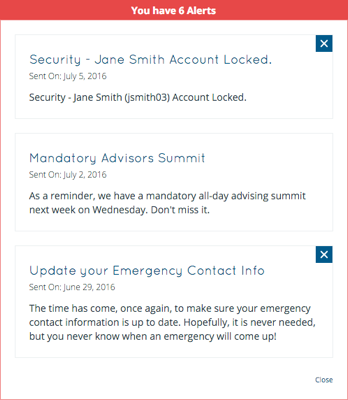 Once you get your Alert discipline down, the critical next step is to consolidate all alerts and worklists into one place. That is why we built our Alerts & Global Worklist products. They can be deployed in tandem offering the best experience or alone for specific client needs. Now employees, managers, students and faculty can easily see what they have to do and they don’t have to hunt for it. If people know there is one list, they are more likely to stay on top of that list. Linking to a half dozen worklists just doesn’t work. Even though PeopleTools’ Event and Notification framework is not widely used today we fully expect it to get a lot of usage in the future. 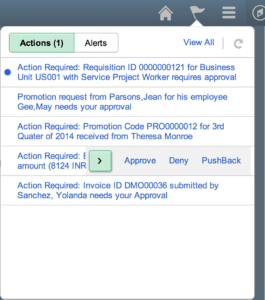 Therefore, we are announcing native integration for it in our IntraSee Alerts and Global Worklist products. Now IntraSee Alerts & Global Worklist deliver on the promise of a one-stop shop for notifications and workflow. When your users log into your site, any alert or worklist item from any PeopleSoft or Cloud system will be shown in a single, consolidated list. Having one place to go will make usage of your ERP systems as simple as using a smartphone. To see a live demo, please contact us and we’d be happy to show you.